Harry Potter Cookbook Without a Butterbeer Recipe? Stumbling my way through Amazon, recently, I found what I’d hoped was going to be a great find; the Unofficial Harry Potter Cookbook!! I got so excited!! Treacle tarts, Kreacher’s French Onion Soup, Mrs. Weasley’s Molly’s Meat Pies, Pumpkin Pasties…..but what’s this? No Butterbeer recipe? How could this be? It’s not badly priced at $11.66 ($8.46 for the Kindle version) for a hardcover cookbook and the Butterbeer omission seems to be the only one. It has a great cover and the inside looks like an old spell book. I supposed you can always depend on online sources for a Butterbeer recipe. In finding this Harry Potter cookbook, I also found another with a similar name: The Unofficial Harry Potter Cookbook: From Rock Cakes to Butterbeer, all Things Sugary and Sweet. However, this one seems mainly focused on desserts and is only available in Kindle format. 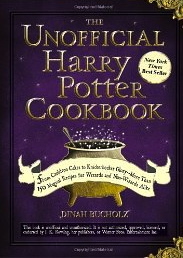 The book does claim to include Treacle Tarts, Pumpkin Fudge, Yorkshire Pudding, Cauldron Cakes, King’s Cross Butterscotch Bars, Harry’s Tea and Get Out Of a Jam Cookies, and Cockroach Clusters among it’s many Harry Potter food recipes. No reviews, yet on that one and the $9.99 price makes it even more expensive than the Kindle version of the full cookbook without the Butterbeer recipe. What do you think? Would you get either one? Let us know in the comments!